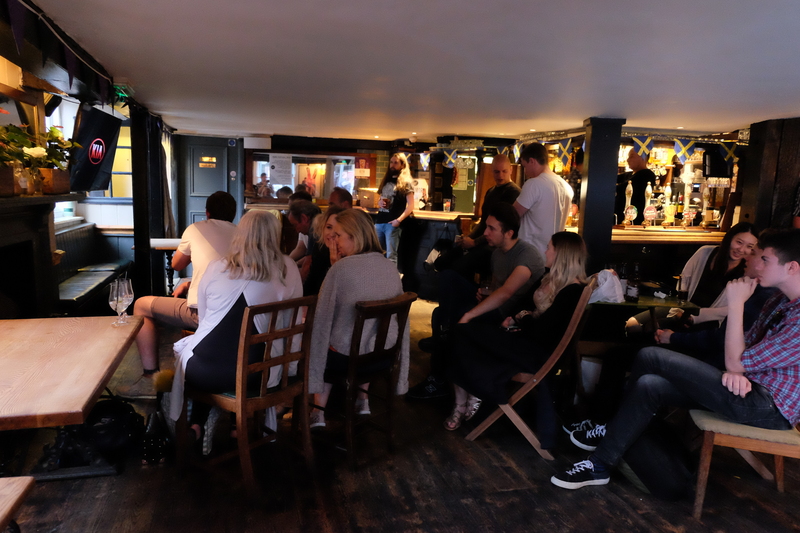 Mass Observation 113: 27.06.16 – MostlyAboutBeer……..
I’m very happy to share an intimate little slice of St Albans. On keg are Fosters Lager, Guinness, Peroni, Aspalls Cider, Addlestones Cider, Vedett, Estrella, Becks, Meantime Pale Ale and Stella Artois. The majority of drink being consumed is from the cask range. Most of the beers on tap are golden in appearance and it’s difficult to know which was which though JHB and Tribute are popular and they’re always on. The golden hoppy range has been influenced by the hot weather. Otherwise the most prominent drinks seem to be Stella Artois (as it’s served in its distinctive branded goblet) and glasses of Pimm’s. 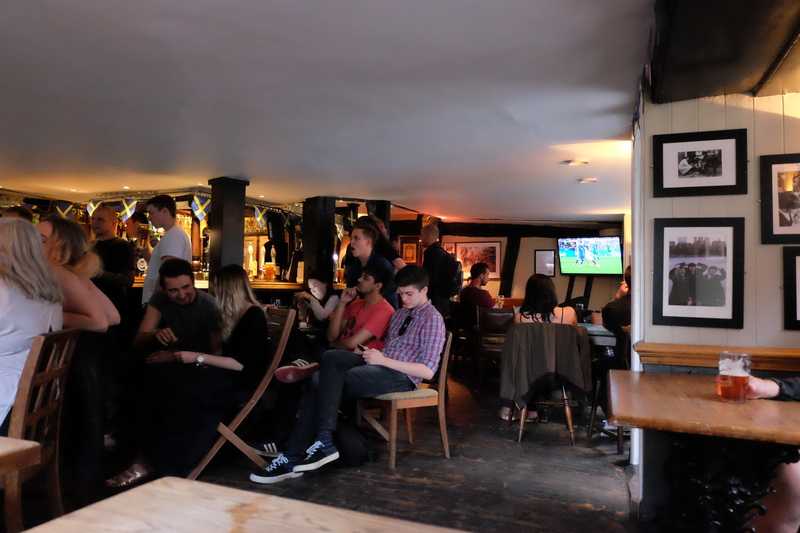 There are about 40 customers and virtually all are watching England v Iceland in the Euros on one of the two televisions. The only ones not involved are one man at the bar with his back to the room, one man sat at a table reading from his smartphone and me. I get a few puzzled looks when I discreetly take pictures. The pub has a bare wooden floor and a low ceiling with vertical black-washed timber supports. Because it’s situated in the middle of Market Place in the town centre, it has no beer garden but a few wooden chairs outside for the smokers. There are none during the match but about ten people go out during the interval in shifts so as not to lose their seats. I don’t see any vapers among them. Just visible in the photo above are some of the pictures of music stars like the Beatles. There is a particular emphasis on Bob Dylan. The pub’s ageing chocolate Labrador (not present as time of observing) is named Dylan after him. There are also historical prints – one can just be seen to the left of the monitor above. The pub claims to be a battlefield pub. The first battle of The War of the Roses from the 15th century is depicted next to a plaque. Another memorable thing about this pub is on the wall above the urinal in the gents: it displays covers from satirical institution Private Eye. Half of them are changed regularly to keep up with current events but a few are black and white and go back to Margaret Thatcher’s time in office. The Boot doesn’t have a Pool table, jukebox or dartboard but it does have a collection of boardgames heaped in a corner I’ve never seen played. The match pretty much did for conversation but during half time the punters became reacquainted with their smartphones and all their faces lit up. I did hear one question: “As ‘e resigned yet?” That’s all I got but I’m absolutely certain it was about the current leader of the Labour party (at the time of writing) Mr Jeremy Corbyn. This is in relation to Britain voting to leave the EU in a referendum and the whole shadow cabinet resigning under his leadership. England went on to suffer defeat against Iceland (I wasn’t still in the pub at that point) so I don’t believe it was about England manager Roy Hodgson who later resigned.